For other uses, see Malva (disambiguation). Malva is a genus of about 25–30 species of herbaceous annual, biennial, and perennial plants in the family Malvaceae (of which it is the type genus), one of several closely related genera in the family to bear the common English name mallow. The genus is widespread throughout the temperate, subtropical and tropical regions of Africa, Asia and Europe. The leaves are alternate, palmately lobed. The flowers are from 0.5–5 cm diameter, with five pink, lilac, purple or white petals. 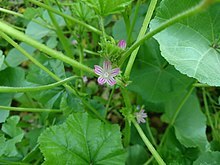 A number of species, previously considered to belong to Lavatera, have been moved to Malva. 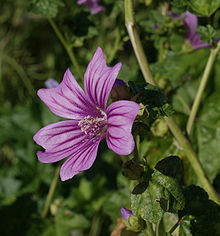 The word "mallow" is derived from Old English "mealwe", which was imported from Latin "malva", cognate with Ancient Greek μαλάχη (malakhē) meaning "mallow", both perhaps reflecting a Mediterranean term. The colour mauve was in 1859 named after the French name for this plant. Many species are edible as leaf vegetables and commonly foraged in the West. Known as ebegümeci in Turkish, it is used as vegetable in Turkey in various forms such as stuffing the leaves with bulgur or rice or using the boiled leaves as side dish. Malva verticillata (Chinese: 冬寒菜; pinyin: dōngháncài, Korean: 아욱 auk) is grown on a limited commercial scale in China; when made as a herbal infusion, it is used for its colon cleansing properties and as a weight loss supplement. Very easily grown, short-lived perennials are often grown as ornamental plants. Mild tasting, young mallow leaves can be a substitute for lettuce, whereas older leaves are better cooked as a leafy green vegetable. The buds and flowers can be used in salads. In Catalonia (Spain) they use the leaves to cure the sting or paresthesia of the stinging nettle (Urtica dioica). Bodos of Northeast India cultivate a sub-species of malva called lapha and use it extensively in their traditional cuisine, although its use is not much known among other people of India. Malva Leaves are a highly cherished vegetable dish in north Indian state of Kashmir. It is called "Soachal". This plant is one of the earliest cited in recorded literature. The third century BC physician Diphilus of Siphnus wrote that "[mallow] juice lubricates the windpipe, nourishes, and is easily digested." Horace mentions it in reference to his own diet, which he describes as very simple: "Me pascunt olivae, / me cichorea levesque malvae" ("As for me, olives, endives, and mallows provide sustenance"). Lord Monboddo describes his translation of an ancient epigram that demonstrates malva was planted upon the graves of the ancients, stemming from the belief that the dead could feed on such perfect plants. ^ a b "Malva L." Germplasm Resources Information Network. United States Department of Agriculture. 12 March 2007. Archived from the original on 6 May 2009. Retrieved 16 February 2010. ^ "Malva L." Index Nominum Genericorum. International Association for Plant Taxonomy. 1996-02-09. Retrieved 2008-05-09. ^ O.E.D (1989) 2nd.ed. vol.IX, p.271 col.3; P.Chantraine, Dictionnaire de la langue grecque, Klincksieck, Paris 1968, vol.2 p.662. The Italian linguist Vincenzo Cocco proposed an etymological link to Georgian malokhi, comparing also Hebrew מַלּוּחַ (malúakh) meaning "salty". Gordon Douglas Young, Mark William Chavalas, Richard E. Averbeck, Kevin L. Danti, (eds.) Crossing boundaries and linking horizons: studies in honor of Michael C. Astour on his 80th birthday, CDL Press, 1997 pp.162-3. ^ Soyer, Alexis (1853). The Pantropheon: Or, History of Food and Its Preparation : from the Earliest Ages of the World. Ticknor, Reed, and Fields. p. 64. ^ Davis, C.J.S. (2010). Malva aethiopica, a new name for Lavatera abyssinica (Malvaceae): an endemic species of the Ethiopian Highlands, Phytotaxa 13: 56–58. ^ "Malva L." Integrated Taxonomic Information System. Retrieved 9 May 2008. ^ UniProt. "Genus Malva". Retrieved 2008-05-09.